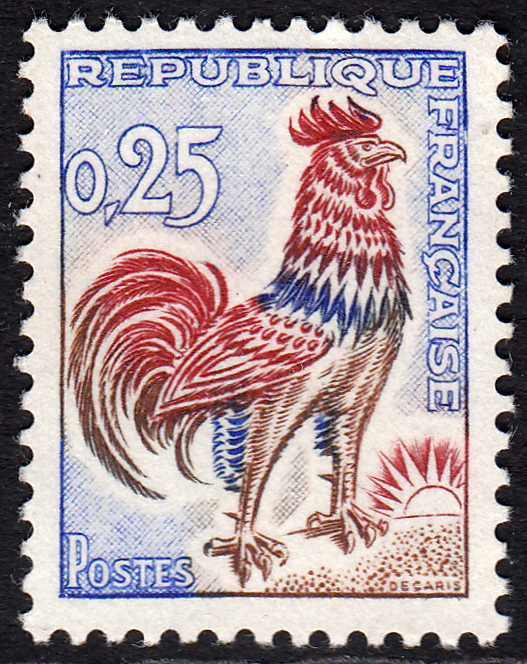 The Gallic Rooster has long been the unofficial symbol of France, the official symbol being Marianne who stands for the Republic. 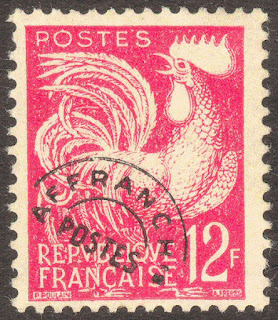 The story of how the rooster claimed the role of unofficial symbol is actually quite an interesting one. It all starts back in Ancient Rome when the biographer, Suetonius (c. 69-140 AD), noted in his book The Twelve Caesars that, in Latin, gallus, which means rooster, and Gallus, which means Gauls were homonyms, which is a fancy word that means two or more words which share the same pronunciation, but mean different things. 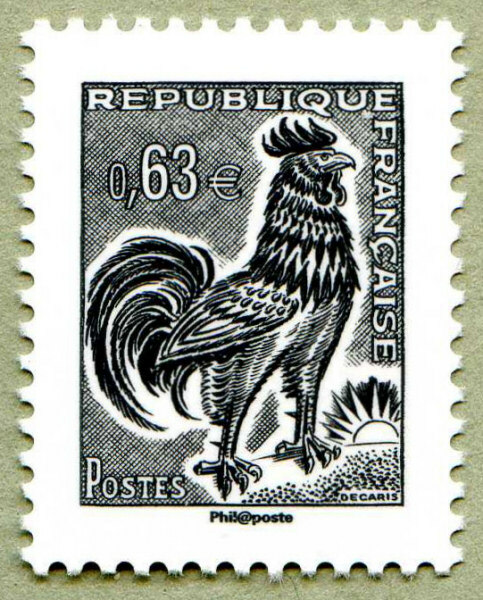 This is not, however, how the Gauls, who became the French, came to use the rooster as a national symbol. 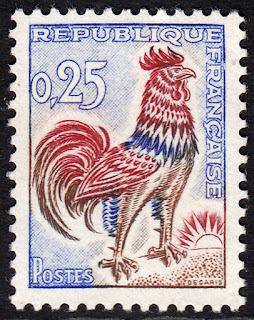 The rooster's close association with France seems to have begun in the Middle Ages, and not in the way you may think. The Latin similarity between gallus and Gallus mentioned above was used by the enemies of France to make fun of them! 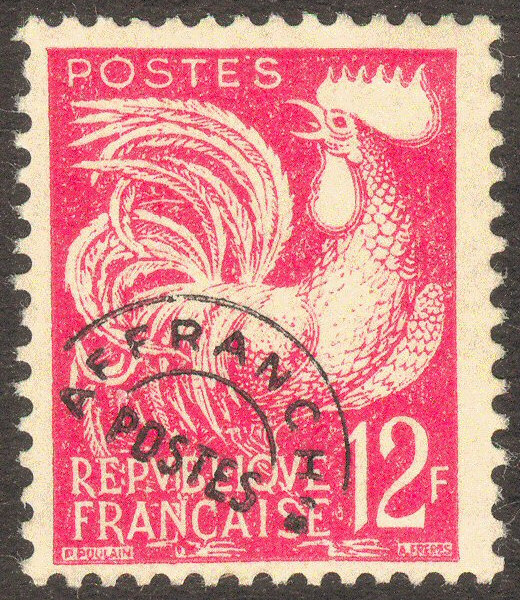 Eventually the French came to use the Rooster as a symbol due to its religious connections - one can also see that the French would've taken on the supposed derogatory symbol to take the sting out of the taunts of their enemies. But, anyway, back to the religious connections. In the bible it is mentioned that just before Jesus was arrested by the Romans, he foresaw that Peter (a disciple) would deny him three times before the rooster crowed the following morning. It turns out, according to the bible anyway, that Jesus was right. 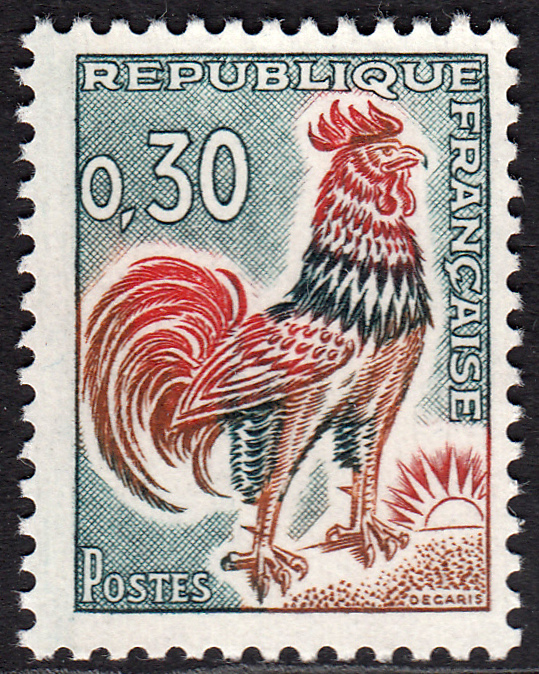 From this tale, it is believed that every morning the rooster crowing was a symbol of the daily victory of light over the darkness. It is also a symbol for Christianity of watchfulness and readiness for the return of Christ. France, being a Catholic state, thus adopted the rooster as a symbol. And the rest is, as we say, history. In 1954 a new design, with somewhat more energy than the first design, was released. This new version was designed by Pierre Poulain. In 1962 Albert Decaris created a new iteration of this French classic. A design, I feel, is striking in its simplicity. 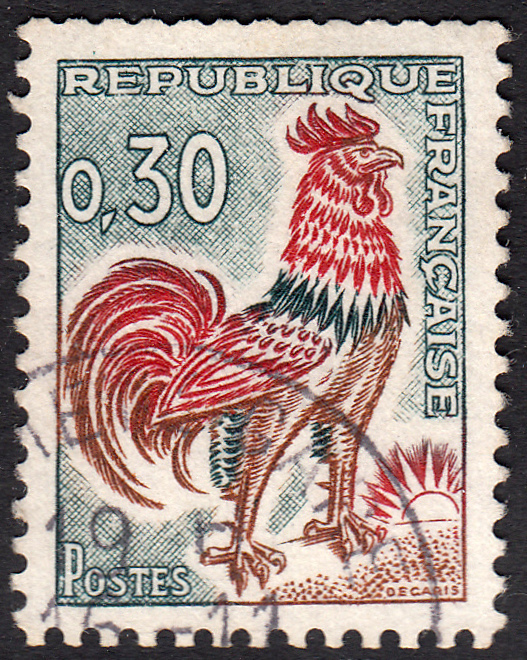 This lovely design was reprinted in 1965 with a new denomination of 30 centimes. But that's not the end for this charming design. Decaris' masterpiece was again used in a 2013 Fifth Republic stamp with the denomination, of course, in Euros. 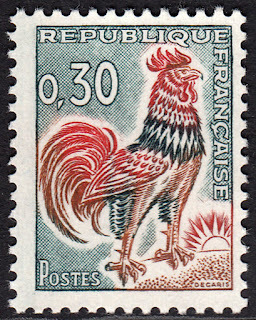 Over the years the Rooster has appeared on many a French stamp. 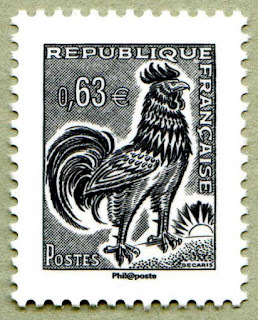 In fact, I'm willing to bet one could create an entire thematic collection of French roosters!